EDIT 10/2014: Since publishing this post 5 years ago it has come to my attention that Chex cereals are not vegan. 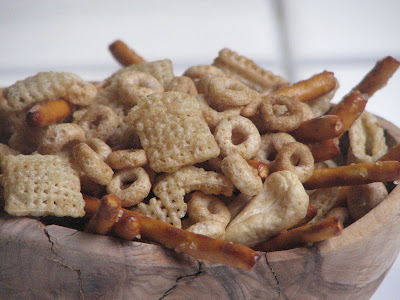 There are lots of Chex like cereals out there that are vegan and would make a fine replacement. I said that I was going to talk about Gingerbread Waffles, but..ehn. They were delicious but I didn't even get a good bad picture of them. It's ok because I have something equally delicious to take it's place. Chex Mix! I'm so surprised by the amount of people who say they've never had homemade chex mix. It's worlds better than the bagged stuff. Barely even tastes the same! My Grandmother always makes huge tupperwares of the stuff around the holidays. Obviously I kept the tradition. Unfortunately I'm crazy and for me, the holiday season starts on October 1st. Fall time! Autumn! It's all a part of the brisk yet coziest time of year. My Grandmother's chex mix is the same as the recipe on the box, but with celery salt instead of seasoned. I veganized it and altered the contents. I'm writing the recipe so you too can customize your fillings and the level of crunch. I like my chex mix not too crunchy and sans bagel chips. Now you can decide exactly how you want yours. 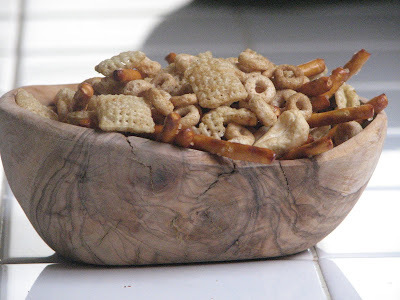 Join in the chex mix tradition. Yay Fall! 1. Preheat oven to 300F. Combine the first three ingredients in a HUGE bowl or clean paper grocery bag. 2. Melt margarine in a small sauce pan over low heat. Once melted, turn off the heat. Mix in worcestershire sauce, celery salt, garlic powder and onion powder. Pour over the cereal mix and stir or roll the top on the bag and shake shake shake. 3. Pour mix onto a large baking sheet and bake for 15 minutes. Take it out and stir around. Bake for another 15 minutes and take it out and stir around. Do this until you reach your desired level of crunch. Mine takes 30 - 45 minutes. Coming up tomorrow or so: Muddy Buddies! Chex Mix's delicious cousin.